Kunisada II (Toyokuni IV) 1823 - 1880, Nakamura Utaemon III as Moriguchi Kuro From the Hakkenden (Eight Dog Heroes) 1852. Oban. 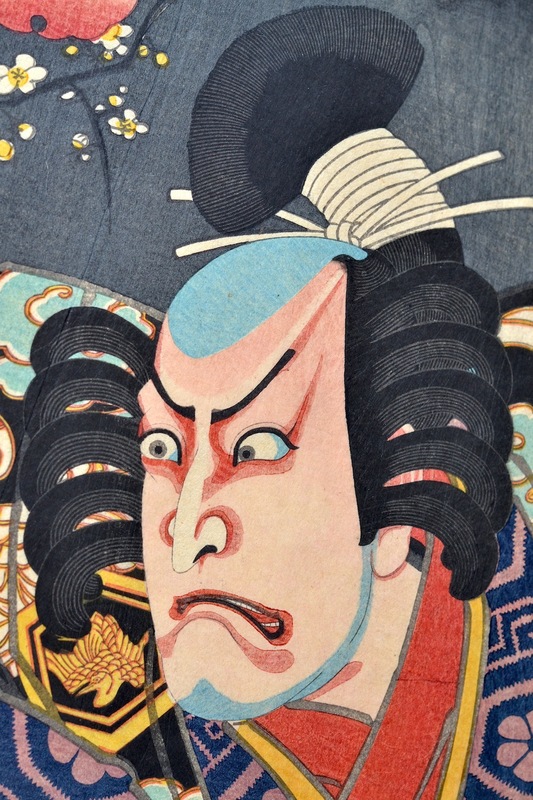 This stunning kabuki portrait is by the lesser known Kunisada II. The print is from his finest series: Hakkenden inu no soshi no uchi (Book of The Eight Dog Heroes), Originally a novel which took thirty years to complete, it was quickly turned into a popular kabuki play. The complex plot centres on the eight offspring of a supernatural marriage between a princess and her father’s dog. Shamed at the birth of her children, she kills herself and the eight beads of her rosary, each representing a Buddhist virtue, become crystal orbs and disperse, the children being reborn to normal mothers sixteen years later. The plot twists and turns as the eight brothers become acquainted as adults. 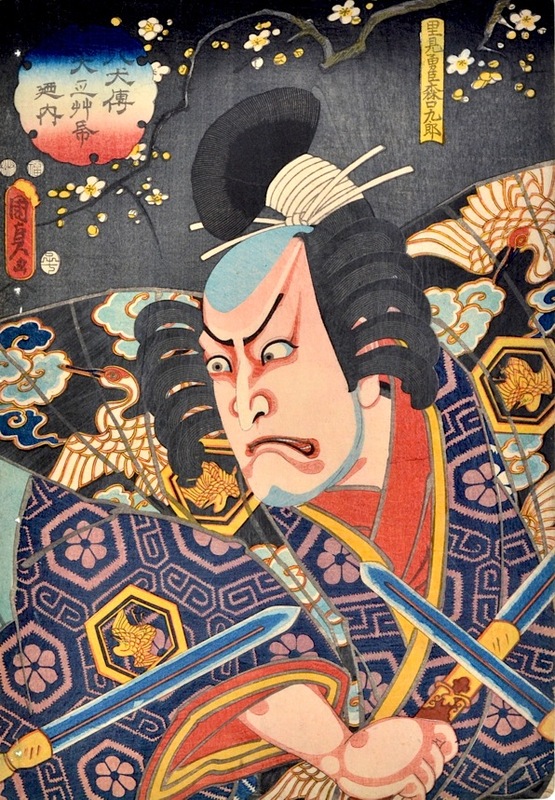 Kunisada depicts Moriguchi Kuro, a retainer in the kabuki play and not one of the eight brothers normally pictured. This is a superb actor portrait, the exotic clothes and hair are lacquered and highly burnished, the decorative designs of the fabrics are particularly rich. Kunisada II was actually Utagawa Kunisada’s son-in-law and is often overshadowed by his successful father-in-law. This work and others from the series demonstrate that he was every bit the equal of his teacher. The print is full size, unbacked and in fine condition. Colour and impression are very fine. The print is in the collection of the Museum of Fine Arts Boston.